"This is an easy and refreshing chicken dinner, great in the summertime. Nice served with mashed potatoes and salad. The salsa is also yummy served with fish!" TO MAKE SALSA: In a small bowl, combine the mango, onion, cilantro, green bell pepper and red chile pepper. Put aside until serving time. Lightly pound the chicken breasts with a mallet to flatten. Beat the egg and milk together. Then coat them in the egg/milk mixture then the breadcrumbs. Chill for 1/2 hour. Saute the chicken in olive oil until cooked through and juices run clear. 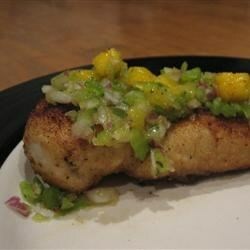 Drain and serve with the mango salsa. Garnish with cilantro leaves. This was one of the best recipes I"ve ever tried! My husband loved it! The next day we also tried the mango salsa over grilled salmon, it was DELICIOUS! Thank you Emma for this recipe. It was very good and very colorful! I would probably add some more seasoning next time. I put some pineapple in too and it added some extra taste. Great for entertaining! I made this for a church function with a "Spa" theme and the group raved!!! I toned down the onion just to be on the safe side.